Bishop James Edward Walsh was born in Cumberland, Maryland on April 30, 1891. He graduated from Mount St. Mary’s College in Emmitsburg, Maryland at the age of 19. James worked two years as timekeeper in a steel mill. He entered the first class of the Maryknoll order of priests in 1912 at Maryknoll, New York. 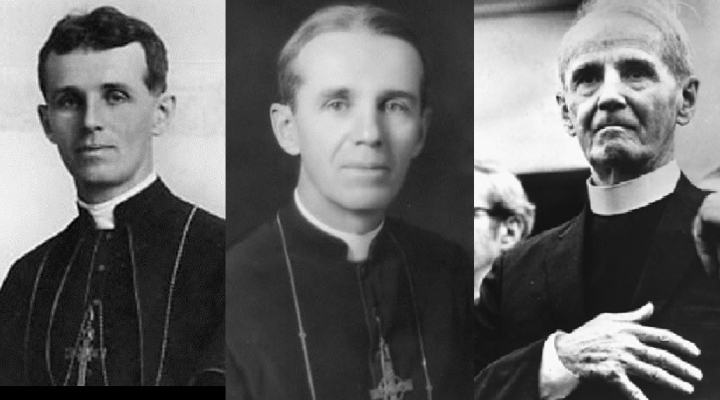 On December 7, 1915, he became the second priest ordained in the Society. Three years after he became a priest, he was assigned as a missionary to the people of China. In 1919, he became Superior of the Maryknoll Mission in China. Pope Pius XI named Father Walsh, at age 36, as the first bishop of the Vicariate of Kongmoon in 1927. Just before the outbreak of World War II, Bishop Walsh was asked to be a mediator between the United States and Japan. He delivered messages from the Prime Minister of Japan to President Franklin Roosevelt. Unfortunately, his work was unsuccessful. The Japanese bombed the United States at Pearl Harbor, Hawaii on December 7, 1941. Bishop Walsh returned to Maryknoll, New York in 1936. He was elected the second Superior General of Maryknoll, supervising Maryknoll’s first mission efforts to Latin America and Africa. After World War II, Bishop Walsh returned to China at the Vatican’s request. In 1949, China became a Communist country. All of the temples and churches were closed. All of the priests were pressured to leave the country. Bishop Walsh loved the Chinese people and refused to abandon them. He was arrested by Communist officials on October 18, 1959 and sentenced to twenty years in prison. The bishop served twelve years of this sentence. During all of those years, he was kept in solitary confinement. When he was interviewed later, Bishop Walsh refused to utter a harsh word against his captors. He was not allowed to have his rosary to pray, so he used his fingers to count the decades of the Rosary. In all of that time, he was allowed to have only one visitor, his brother William, former Maryland State Attorney General, in 1960. A prolific writer, Bishop Walsh wrote six books and many articles on mission life and work. Bishop Walsh died at Maryknoll, New York on July 29, 1981. He was ninety years old.